She began drawing at the age of four and was the first person to receive a Fine Arts Degree in Drawing at Carnegie-Mellon University. The Flemish school of the 16th century Dutch masters was her inspiration and she tried to paint like them but realized her talent really was in drawing. she developed her own drawing technique that she as used to create her black and white compositions. Lipton ignored her teachers as they told her figurative drawing was not done anymore and she should express herself in different ways using shapes and forms. She know she did not want to paint abstractly or do installation art. she wanted to create something new that hadn't been seen before and she was very successful as her drawings take on a luminosity not seen before in drawings. Read and see more at Laurie Lipton: Carnival of Death at the Last Rites Gallery. 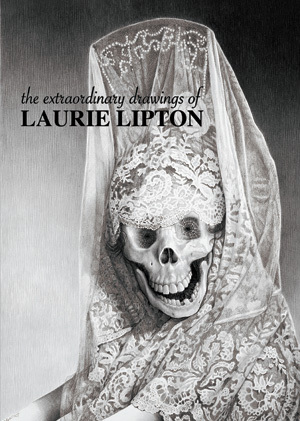 Her book is called, The Extraordinary Drawings of Laurie Lipton which we are ordering in the Arts Division.